Ararat, is a province of Armenia. For reviews, maps, other places to visit, and tourist information, refer to the Ararat Province trip planner. Moscow, Russia to Ararat Province is an approximately 8-hour flight. The time zone changes from Moscow Standard Time to Armenia Time, which is usually a 1 hour difference. In April, Ararat Province is somewhat warmer than Moscow - with highs of 24°C and lows of 8°C. On the 4th (Wed), wrap the sightseeing up by early afternoon so you can travel to Areni. Areni is a village in the Vayots Dzor Province of Armenia. 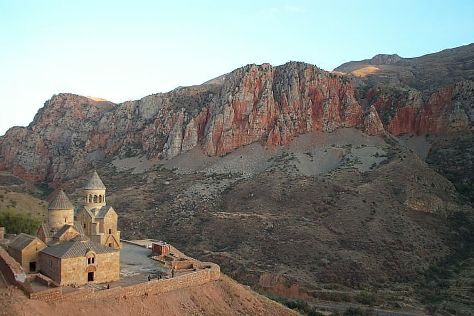 Start off your visit on the 5th (Thu): explore the fascinating underground world of Mozrov Cave, explore the stunning scenery at Noravank Gorge, take in the spiritual surroundings of Noravank Monastery, then take in the architecture and atmosphere at St. Astvatsatsin Church, and finally learn about winemaking at Areni Wine Factory. To find more things to do, photos, reviews, and tourist information, go to the Areni trip itinerary planning site . Traveling by car from Ararat Province to Areni takes 1.5 hours. In April, plan for daily highs up to 24°C, and evening lows to 7°C. Finish your sightseeing early on the 5th (Thu) so you can travel to Tatev. To see ratings, reviews, maps, and more tourist information, read our Tatev trip site . Getting from Areni to Tatev by car takes about 2.5 hours. April in Tatev sees daily highs of 24°C and lows of 7°C at night. Wrap up your sightseeing by early afternoon on the 6th (Fri) to allow enough time to travel to Alaverdi. Alaverdi, is a town in the Lori Province at the northeastern part of Armenia, near the border with Georgia. Start off your visit on the 7th (Sat): get engrossed in the history at Mikoyan Brothers Museum, pause for some serene contemplation at Odzun Church, take in the views from Sanahin Bridge, then pause for some serene contemplation at Akhtala Monastery, and finally take in the spiritual surroundings of Monasteries of Haghpat and Sanahin. Keep things going the next day: take in the spiritual surroundings of Kobayr Monastery and then delve into the distant past at The Monastery of Bardzrakash St. Gregory. 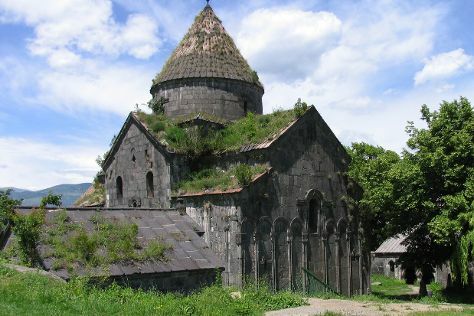 For photos, maps, and tourist information, you can read our Alaverdi trip itinerary builder tool . You can drive from Tatev to Alaverdi in 7.5 hours. Expect little chillier weather when traveling from Tatev in April: highs in Alaverdi hover around 20°C, while lows dip to 9°C. Wrap up your sightseeing on the 8th (Sun) early enough to travel to Yerevan. Old and new sit side by side in Yerevan, showing the country's capital to be a city on the move, but also proud of its history and traditions. Venture out of the city with trips to The Monastery of Geghard (in Geghard) and Garni Temple (in Garni). There's still lots to do: make a trip to Republic Square, stroll through Lovers' Park, appreciate the history behind Victory Park and Statue of Mother Armenia, and indulge your taste buds at Noy Yerevan Brandy Factory. For where to stay, traveler tips, reviews, and tourist information, read our Yerevan trip planner . Drive from Alaverdi to Yerevan in 3.5 hours. In April, daily temperatures in Yerevan can reach 24°C, while at night they dip to 8°C. Wrap up your sightseeing on the 11th (Wed) to allow time to travel back home.